1) First Aid Kit: I use a small zip lock bag for my first aid kit as the bag keeps everything inside dry. These are some of the items that I carry. You may add or delete some items based on your needs. The kit takes up very little space in my fanny pack and I rarely ever use the first aid kit. It is always there if I ever need it. Most of the items were bought at a discount store that sells trial samples. They come in their own individual small packs. 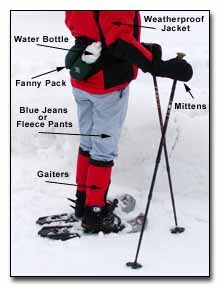 Always be prepared by deciding on what to bring snowshoeing before you start your hike for the day.